Few activities have been used throughout the centuries to depict various aspects of life quite like riding a bike has. We’ve seen it as the perfect explanation of how life works, as can be seen in examples like the quote often attributed to the great Albert Einstein: “It is the same with people as it is with riding a bike. Only when moving can one comfortably maintain one’s balance”. Religion and business are other areas people have attempted to explain relying on bikes, so what we can make of this is bikes are an essential part of our lives. Okay, along with serving for better grasping the meaning of life, as established, bikes are well known in helping us maintain a healthy lifestyle too. When it comes to the latter, you might ask yourself when is the right time to start reaping the benefits of riding a bike, and the answer is as soon as possible, something especially important for children. 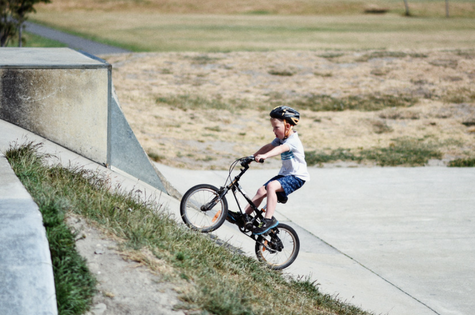 For parents, it’s not that easy to picture their little ones on bikes, exposed to risk of accidents and injuries, but a bit of stumbling and falling, a bump and bruise here and there, are part of growing up. If your child is three years of age already, then it’s time to go on the quest for the ideal bike. With the many types of child bicycle available for sale by bike retailers, providing you with plenty of choices in terms of convenient prices and brands, you wouldn’t be able to say no to getting your child the bike. Even as we grow, we still remember our very first bikes dearly, so take it as advice to consider your child’s opinion when choosing the first one – after all, it’s them who will be riding it! The location and frequency of riding are sure to help you with the choice additionally. Both are essential when determining whether to opt for mountain or road bikes. Also, don’t forget to consider the size appropriate for the age because it’s what makes or breaks the riding experience; Remember, it has to do with how safe a ride is. If you don’t know how to do so, you can count on sizing charts to be your guide, though inquiring the experienced staff would come in handy too, saving you time. The sizing charts, with emphasis on the wheel size, start from 12” wheels suitable for kids aged 2 to 3, whereas 26” are suitable for kids aged 11 and above, as shown in the chart below. In case you’re wondering whether to carry out the purchase of the child bicycle the old-fashioned way, or use the perks of the internet, have in mind when buying online you have the chance to check everything in seconds, starting from the height of the bikes, followed by the details about the tyres, the saddle, the bars, the gearing system, the brakes, as well as additional features like the frame, and the standard extras: kickstand, bell, and safety reflectors. Since it’s kids we’re talking about, safety needs more consideration also, depending on how much of riding practice your child has had, so along with the child bicycle you have to pay attention to the accessories too. Safety primarily means use of helmets, as they provide protection for the head and can prevent serious injuries, but not any helmet would do; it’s important to choose one that fits perfectly, doesn’t move back and forth and isn’t too tight. Though before a child bicycle used to be heavy enough to be compared with the weight of an adult bicycle, nowadays at a time when technology has advanced considerably, models are much more lightweight, especially those of quality, so you wouldn’t have to worry about whether your child would be able to ride or carry it with ease. Getting back to the benefits of riding a bike, the reason it’s advisable to get your child into this type of exercise early on comes from the fact it positively affects the well-being. At a time when kids are more prone to being inactive, sticking to spending as much screen time as possible, bikes are the means that help a child establish a healthy habit of exercising regularly, preferring the company of the outdoors. Sure, bikes are ideal fun for spring and summer, but you can easily transform the outdoor bike into an indoor one as a stationary bike, meaning regardless of whether it’s raining or snowing, your child could still ride at home and maintain the habit. Speaking of habits, it’s not just health all there is to it, there’s also the habit of protecting the environment, choosing this kind of transport instead of vehicles. Knowing kids are the future, educating them to be careful about the choices they make regarding nature is the way to ensure it would be preserved. Besides, when you’re with a bike, you can never complain about being stuck in traffic, right? If you need a reason more think of riding as an activity for the whole family, staying healthy and bonding over a few rides around the neighbourhood or the city park.